The news about a popular shopping cart platform AmeriCommerce recently becoming Spark Pay came as a surprise to many. It left numerous Internet users wondering why to rebrand an already well-known product. However, it is not only the name that has changed but the ownership too. The thing is, AmeriCommerce has been acquired by one of the top 10 banks of the USA, Capital One. The new owners are moving in the direction of satisfying mostly small business owners and going global. This is the reason the platform that has got quite a lot of domestic fans has been given a new name that no more suggests its origin and orientation. Other than that, both shopping cart functionality and interface have undergone some significant changes, and been improved to appeal to the new users. Let’s take a deeper look at what Spark Pay has to offer to those looking to build an online store. Spark Pay obviously was created with modern business people in mind. It makes starting a store as fast and easy as possible, although it cannot be blamed on the lack of advanced functionality. Being a web-based tool, Spark Pay lets its users focus on selling, while hosting, security and the rest of technical stuff are being taken care of by the platform itself. The intuitiveness of the admin panel ensures an easy learning curve, which means that getting about the store will be no more difficult than managing a blog. Although Spark Pay is packed up with numerous features and options, they don’t have a daunting effect on the newbies and can be “put aside” for when they are needed. Thanks to the 51+ ready-made themes to pick from, and a convenient drag-n-drop live view theme editor, it’s easy to make the e-shop look good even for users with no expertise in design. However, if you’re looking for advanced customization possibilities, there’s an option of editing all theme aspects via CSS or HTML. And that’s not it - you can also order theme customization by a Spark Pay team to save your time and efforts and get a totally personalized store appearance. It’s worth mentioning that all Spark Pay themes are mobile ready. In other words, your online store will look good on all types of mobile devices with different screen sizes, as well as laptops and desktop computers. Many AmeriСommerce users that shifted to Spark Pay claim that the admin panel has significantly improved and become much more user-friendly and neatly looking. Nevertheless, it doesn’t mean that any advanced features are gone. 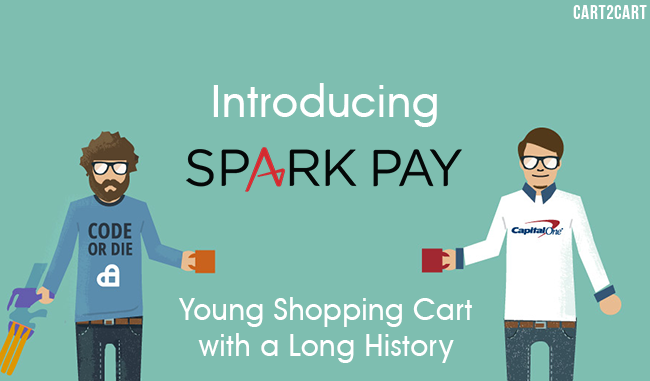 Spark Pay offers a robust functionality set that would attract even seasoned e-Commerce pros. One of its strongest advantages is the multistore management - basically, you can add an unlimited number of stores and manage all of them from one backend, which is certainly convenient for those whose time is money. Spark Pay recognizes the modern tendency of using social networks for shopping. Therefore, it not only provides social media integration for most popular portals, but goes further, enabling easy creation of a Facebook store, selling on multiple sales channels via product portal feeds, and even blog posts. Also, thanks to the ability to add multiple blogs to a store, the seller gets an extra SEO advantage plus the chance to better segment the audience and embed the necessary products or categories on individual blog posts. There is a great deal of already available applications, most of which are paid. In the case of need, there’s an option of ordering a custom integration developed by the Spark Pay techs. The most popular integrations include Quickbooks Synchronization, Mailchimp, Wufoo, Avalara, Yotpo, Google Shopping etc. Other than that, Spark Pay announced integration with its native Spark Pay Merchant Services for payment processing coming soon (at present, this service functions separately). Being backed by the bank with a solid reputation, it might be a good option for merchants. As to the security, it is definitely taken seriously at Spark Pay. This cart is PCI compliant, which means a high level of protection for online shoppers. Providing hosting by Rackspace, Spark Pay offers an extra insurance against downtime and accelerated GZIP compression for better performance. All in all, Spark Pay shopping cart appears to be a decent software, taken its numerous strengths. It’s moderately priced and doesn’t charge any transaction fees, has a robust feature set, it is quick and simple to setup and yet has powerful customization capabilities, good reporting tools, and is frequently updated. However, Spark Pay does have its weaknesses, like bandwidth overage fees and somewhat limited customer support. Nevertheless, the ultimate way to decide whether this shopping cart platform would suit your needs is to give it a good test drive during the 14-day trial period. And if Spark Pay turns out to be your cup of tea, be sure there’s an excellent opportunity to switch your current platform with Cart2Cart. Start with free Demo Migration now - it works with Spark Pay trial store too! We will be happy to hear about your findings and recommendations on Spark Pay, so you’re welcome to share them in the comments below.